I’m currently organizing my house. 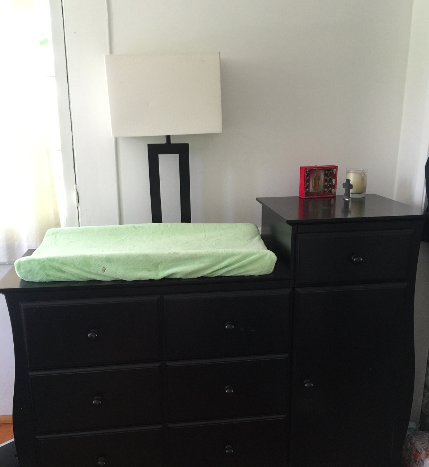 The top of the changing table is as far as I’ve gotten. But still, I have dreams of one day having “a place for everything and everything in its place” – which I thought was from Mary Poppins, but Google is telling me that Ben Franklin said it. Maybe I just wished I had Mary Poppins finger-snapping cleaning ability and merged the two. Now, I’m going to admit there are days where I have started to tidy up and given up, reasoning that it would just make more sense to move. However, not only are we halfway through a two-year lease, but after moving four times in four years, I don’t particularly have desire to move at this exact moment. Why isn’t my house perfectly tidy and organized? See Exhibits 1, 2 and 3. So with that off the table, I’m left to tackle the chaos. The problem is I’m pretty sure things multiply in my house when I’m out – no matter how much I throw out or give away, there’s never any less stuff in our house. I don’t know if Shopkins can breed or what. Moreover, I have a 1-year-old who believes it’s his life mission to take out two things for every one item I put away. I’m not even lying or trying to be marketing-y (yeah, I just made that word up) when I say my new approach is driven by one of the themes in our new game Forgotten Trail: persistence. I think one of the issues that I’ve had in getting my house organized (aside from the whole being busy working and traveling and raising three kids) is that I kind of look at it in its complete disorganization and just find it overwhelming. I don’t have the couple of days straight it would likely take to go through everything at once – especially with my sidekicks working against me. I realized it’s kind of been like that with developing our games as well. We start and they don’t even exist. Then they do but the initial versions are rough. Then little by little, we clean them up to the point where they’re commercial quality and people can — and want to — buy them. Can you find the pencil bag here? I couldn’t either. Love the photos! I can see where being a busy working mom would make it hard to even find the time to persist on taming personal clutter. The fact you have moved often, and have a housekeeper, is actually a blessing. You already have some clutter removed, and order started. I have found working with friends, and family, clutter is hardest to remove when it is personal. You might consider doing a I help you and you help me with your people on trouble areas. I have found the stress, and shame, of the clutter goes magically away. I noticed with parents, with children, assigning a toy box to each of the babies helped them train their young ones to place their personal toys in the box. Observing this, it seems the babies find other things to fight over than individual toys in boxes in time. Of course, a young toddler it make take some time to train them to a personal box. It is a given teaching the young to make their beds, put the clothes in the hamper, and trash in the trash room cans, may not work at first. But I have noticed training those habits seem to work on the babies over time. So I encourage you to keep up the good work with your children. On clutter, the key I have learned is making it a family effort, and finding time to sit with whoever has the closet, or room, and have them sort what they want down. Finding the time to have a family purge may deserve the mission impossible music. I really believe though it will be worth it. Good luck, and when you find time, keep us updated! I believe you will get it! Thanks! It is actually working – slowly but surely, I am seeing progress. Glad you enjoy the posts!